December in Smithville is a Winter Wonderland! When you get caught up in the hustle and bustle of the holidays, plan a day at Smithville to slow it down, enjoy your family and be reminded of the simpler pleasures of the holidays. Smithville in December is just what your holiday’s need! 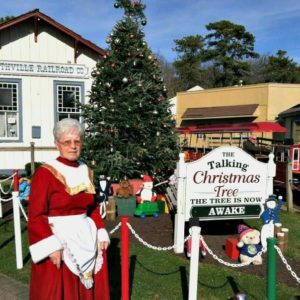 Light Show on the Lake (Thanksgiving thru Jan 6th)… Over 120 Christmas Trees made from over 50,000 Christmas lights, magically float on Lake Meone in the center of Historic Smithville. The moment darkness falls, an orchestrated show of lights and music is played out across the lake. The lights seem to dance and chase each other to the music all the while reflecting of the water’s surface. This show can be seen from either side of the village as well as the bridge. children… Many children get a little scared of Santa, this large robust man with a beard and red coat. Smithville decided to bring you the softer side of the family. Mrs. Claus is a simple elderly German woman with grey hair and a breathtaking, handmade red dress. She has taken a little time away from helping Santa to make her very own public appearance right here in Historic Smithville. We have transformed the antique arcade (#65 on the Walking Map) into a Christmas area fitting for Mrs. Claus. Between the hours of 1:30 and 4:30 every weekend in December she will sit and read stories to the children, take pictures and chat with you and your children about the upcoming holiday. The Magic Talking Christmas Tree… If you are having trouble locating Mrs. Claus, you can always ask the Magic Tree. You heard me right!! Next to the Smithville Train Station an over sized Christmas tree is brought in from Santa’s private forest. This beautifully decorated Christmas tree awakens to talk with you and your children about the upcoming holidays and, well, anything you might want. Right next to the Magic Talking Tree the Smithville Train has decorated it’s tracks for the Holiday’s. For $2.00 per person you take a 6 1/2 minute ride on the outskirts of Smithville on this fun, whimsical train. Both the train and carousel are open village hours weather permitting throughout the month of December. December 6th is Girls Night Out! December in Smithville has something for the Girls too! An evening for the ladies to shop and celebrate the Holiday season together. There will be wine and cheese, raffles, discounts and other benefits for evening shopping. Grab your best girl friend and come join us! Each year the shoppes at Historic Smithville thank their loyal customers with a Hospitality Night of Discounts, Refreshments, Live Entertainment and Raffles. This year Hospitality night is Saturday, December 2 begins at 6:00pm.